Last year, I shared a post that laid out the history of my credit card rewards. I’m talking about signing up for a new credit card just for the free money. Back in June, I shared about signing up for the Chase Sapphire Preferred card, and at the time it was offering a 45,000 point bonus (with the first year annual fee of $95 waived). In order to get the 45,000 points, I had to spend $4,000 on the card in the first three months as a new cardholder (this accounted for 40,000 of the bonus points). Then if I added an authorized user I would get an additional 5,000 bonus points (no cost to add an authorized user). The cash value for 45,000 points is $450…just for signing up and spending what we were already going to spend. We ended up opening a second one in my wife’s name and this time she added me as an authorized user. That was another $450. This was really the perfect card for us, based on where a lot of our discretionary spending goes. It came with two points on all spending for dining and travel, and one point for every dollar spent on everything else. Over the past 16 months, we have received about $2,000 in cash back from cashing in our points. Recently I found out about the new Chase Sapphire Reserve Card, which is really just a better more lucrative rewards card when compared to its predecessor the Sapphire Preferred. The initial sign up bonus is 100,000 points or $1,000 in cash (as long as you spend $4,000 in first three months). And Chase really upped the ante by rewarding three points for every dollar spent on dining and travel. You still only get one point for all other spending. You also get an annual statement credit of $300 for travel-related expenses. Well, it comes with a $450 annual fee. But take a step back and put this into perspective: with the $300 annual statement credit that’s really only $150 net per year, or $55 more than the Sapphire Preferred ($95 annual fee). Over the past 12 months, we have spent approximately $24,000 on dining and travel and should continue at this pace for the indefinite future. Based on the 3X points for these categories, that is 24,000 points, or $240 per year if redeemed for cash (compare this to the 2X points we were receiving with the prior card). So, even with the additional $55 annual fee, we still come out ahead by $185 (in year two and beyond). Due to the signup bonus, we will end up netting $1,090 in the first year, just for signing up for the card and replacing the spending we were doing previously on the Sapphire Preferred card. As soon as we hit the spending minimum we will be applying for the same card in my wife’s name. This should happen sometime in late November. That will be another $1,090 in free money for a total of $2,180 just for switching out the card we currently using. The question is whether we keep either of them open. We will for sure close one before the annual fee renews, but we will likely keep one open due to the more lucrative point structure pointed out above. The question is whether we will add an authorized user on the card we decide to keep. Why is this even a thought? The Reserve card charges $75 for an authorized user, whereas the Preferred does not. That said, there is still room in the additional $240 benefit in additional points to cover that $75 and still add incremental benefit. Why the $75 fee for an authorized user, you may ask. Chase charges this $75 fee for the access to over 900 airport lounges that comes with the card (the $450 only covers one person). So, essentially you are paying for the additional card user to have access to the lounges. Hmmm…do you want your travel partner to lounge with you, or not? I know I do! Besides lounge access, there is another benefit that comes with the card, worth $100, and that is up to $100 application fee credit for Global Entry or TSA Pre-check. This is something my wife and I had considered doing in the past but weren’t sure it was worth the cost. There are a lot of other benefits I am not listing, but that you can see here: click this link. There you have it, my latest credit card sign up. 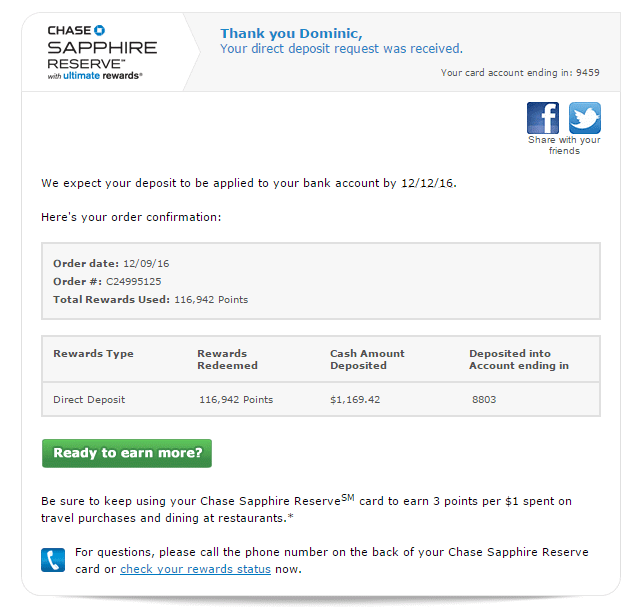 I got my Chase Sapphire Reserve card back in October and then we applied for one in my wife’s name in November. We have since hit the $4,000 spending requirement for an additional 100,000 point bonus and have also earned another $600 in statement credits. You will see in the screenshot below that we currently have 5,522 points, with another 102,618 coming through on the next statement. We have a transaction pending that will get us the additional $177 to hit our second $300 statement credit for this card. When everything is said and done we will have cashed out $3,450.82 when you consider $1,200 worth of statement credits between the two cards, $1,169.42 that I’ve already redeemed, and the pending value of my wife’s points of $1,081.40. All of this for about five minutes of our time per credit card application. After deducting the $450 annual fee ($900 for both cards) we made a cool $2,550.82. That is an effective hourly rate of ~$15,305 or $32.8M per year. Yeah, I’d take $32,000,000 this year! Keep in mind that if you are willing direct a bit more effort than this you could do even better, by using the points to actually pay for travel-related expenses. 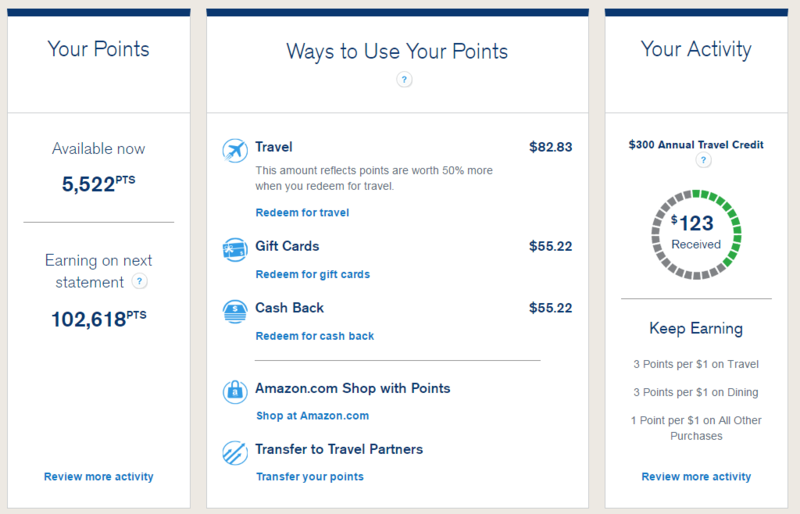 The points are worth 50% more when used to book travel through Chase. Are you leaving free money on the table? I don’t care how much money I make, signing up for a credit card for this type of bonus is totally worth the five minutes it takes to get approved. It’s the smart way to spend what I was going to spend anyway. How about you – any genius credit cards hacks you do? Share in the comments. I’m fascinated by the idea of card churning. How has it affected your credit? I know a lot of people churn quite often and I always wonder what the ramifications are. I’ve been looking for a better rewards card lately but it’s so tough since I despise most banks. Gah! Mrs. Picky Pincher – I have not noticed much impact to my credit score over the past couple years, actually the trend has been up. As I type this response my credit score is at 809 and 812 with two different rating companies. We only do 1-2 cards a year. Well done! I’ve started doing some basic credit card churning and am planning on optimizing my credit cards this year. If I could hit $3k like you, that would be fantastic! Nice Jon! Go get that FREE money. That is some crazy spending, but also, crazy rewards! I was leaving free money on the table until earlier this month. I finally got a Target Credit card, 5% back on Target purchases, and an Amazon Credit Card, 5% back on Amazon purchases and 2% on select purchases. Trying to optimize my finances for the future! I haven’t dove into rewards hacking too much, but sounds like a fun and interesting game! Thank you for sharing your experience. I have the Amazon credit card as well, and just got a notification saying my cash back is increasing from 3% to 5%. If your normal spending is already up there, there are some very lucrative bonus offers out there. I have the Sapphire Reserve card as well. Excellent rewards! I agree that it easily makes up for the cost of the card. It has become my standard daily use card. Same with us! We have both the Sapphire Reserve and Preferred, but we plan to keep the reserve and call to have the Preferred downgraded to a card without an annual fee when renewal time comes. I love getting reward points.. I just wish we had promotions like that here. I think when you sign up for a card you get 1000 points and 1.5 for every dollar spent. And 6000 points represents $50. Last year I had put all my rewards points towards the airfare for our honeymoon. Slyvia – when you say “I just wish we had promotions like that here”…where is here? Wow, that is pretty significant. I just did a Chase business card with 60k points which I was really happy with, but 100k points for a personal credit card is great. Makes sense they wouldn’t waive the first year fee. I haven’t done too many deals like this, but figure 1 a year might be about right. I’ll probably close the account from the previous year when I sign up for a new one. Brian – 50,000 to 60,000 seem to be normal, I don’t see many of the 100,000 bonus point offers. My fiancé just barely made it into the Chase Reserve (the 100K bonus expired last week). I’m kicking myself that we weren’t more on top of it so we could have used the $300 in 2016 and the $300 in 2017. Now we’ll have to wait until 2018 to get the other $300 and then cancel within the first couple of weeks of January. All told, we’ll have over 300,000 points (1 Amex Platinum, 2 Chase Reserve) earned over the last year to use on our honeymoon. That doesn’t even count our spending, which will easily add another 50,000 points. We should have a lot of options! One other benefit for the card is the $100 Global Entry rebate. I highly recommend getting into the program if you’re not already, since you also get TSA Pre-Check as a side benefit. I saw a number of posts about the window for the 100,000 bonus points was closing. Also read an article that it cost Chase about $200M so far. That is just nuts!!! I really need to take advantage of the $100 Global Entry rebate that I have yet to do. However, in the middle of typing this I did go start an application, which I will need to finish from home so I can enter in my passport information. I’m with you, Josh! I wish I had picked up the card in November to realize the 2016 travel credits. Oh well, it’s still a great deal nonetheless. I just got my wife the card a couple weeks ago. My wife told me about this idea sometime late last year. She said a new guy at work was actually doing this. Was that you? LOL. I told her that it takes so much discipline to do this and if she wants to do it, she can do it alone. To date, she has not done anything. I’m a one credit card person for over 10 years now. It’s an AMEX. Bernz JP – I don’t think it was me! What makes you say “it takes so much discipline?” This has been a pretty effortless activity for our household and it has provided us at least $20,000 in cold hard cash – all for spending the money we were going to spend anyway and strategically choosing a card for HUGE bonuses.